Mindfulness is all the rage these days. Rooted in ancient Buddhist tradition, it’s now respected by the scientific community as an effective way to fight anxiety, treat heart disease, lower blood pressure, reduce chronic pain, and improve sleep. And perhaps unsurprisingly, mindfulness at work is now a huge trend as well. Research shows that mindfulness at work can improve your focus, attention, and ability to work under stress—all great assets in the workplace these days. What is mindfulness, exactly? Simply put, it’s focusing your awareness on the present moment. Not thinking about the hectic morning you had, worrying about a presentation you have to give this afternoon, or planning what you’ll cook for dinner tonight. Instead, it’s paying attention to what you’re feeling, thinking, and seeing right now, without judgment. There’s no “right” or “wrong” way to think or feel. While mindfulness is straightforward, it’s far from easy. 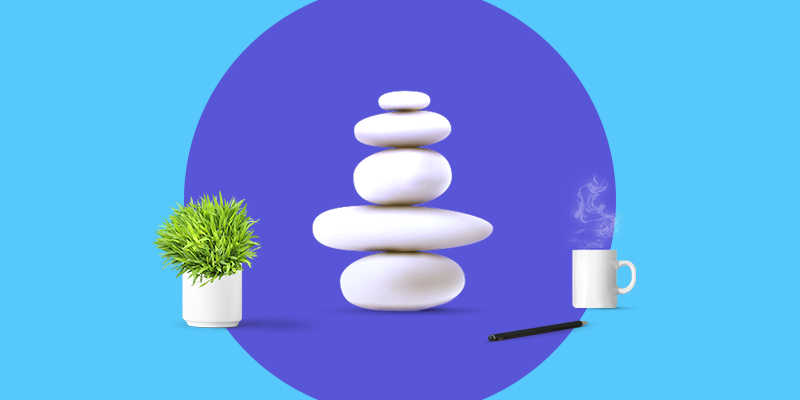 We listed five ways for you to practice mindfulness at work. Not only will it reduce your stress and make you happier; it’ll also boost your productivity and help you achieve more every day without working longer hours. The day has come to an end and you’re about to go home. Before you do, take a few minutes to see what you’ve managed to accomplish and what is left for tomorrow. Try to organize your to-dos by these three criteria: priority, focus level required, and how long each task will take. Many people are most productive first thing in the morning, so start your day with the most important and demanding tasks. (See: Eat that Frog.) Then work on medium-priority assignments, and save your least demanding tasks for later in the day. That way, you can accomplish more each day and rest assured you’ll always get the most important things done. Many times you arrive to work, but you aren’t really present. Traffic was terrible, you had an argument with your partner, your kid is sick, your banker has tried to call you three times, and your dog peed on the carpet just as you were walking out of the house. You’re sitting down in front of your computer to start the day, but your thoughts are anywhere but here. Just 10 minutes of mindfulness meditation every morning can help you regain focus and calm. Make a playlist of a few quiet and relaxing songs, find a quiet room, sit down on a comfortable chair, close your eyes, breathe calmly, and relax. Try to observe your thoughts as they come and go without judging or resisting them, but simply being aware of them. After a few days of practicing you’ll start to feel more focused and productive throughout the day. Need some meditation help? Try an app! Check out our recommendations in 10 productivity apps you need to get organized and be awesome. Many people view the “ability to multitask” as a strength or even requirement in today’s workplace. But the truth is that multitasking is a farce: people can’t actually concentrate on multiple things at once. What you’re actually doing is task switching: performing multiple tasks in rapid succession. It may seem efficient on the surface, but task switching is incredibly disruptive, time-consuming, and sloppy. Studies show that task switching can cost as much as 40 percent of someone’s productive time. Instead of juggling lots of things at once, try to work on one task at a time. Label just one action item as “Now,” and move to the next one only when you’re finished. If you can, turn off notifications on all your devices. You can (and should) make time for reading emails and returning calls as a separate and designated task. Though it’s a tough one, this change will do wonders to your productivity. Create a playlist with songs that calm you down (or search “concentration music” on YouTube.) Get yourself good head/earphones, preferably ones with noise cancellation if you can afford them. Another added value to having earphones is that even without listening to music, you send a message to others that you are busy, thus reducing interruptions. Avoid logging on to social networks while you’re working. You receive an unpleasant call from one of your clients and feel shaken up. You still have a lot of work to do, but you’re finding it impossible to concentrate on your tasks. Take a few minutes for yourself and write down how you feel at that very moment. No judgement. You can’t control these thoughts and fighting them is useless and takes a lot of energy. Becoming more aware of your own emotions as they arise can help you be more flexible and resilient in the face of difficult situations. Mindfulness at work will not only help you stay sane and feel better; it’ll also boost your productivity and help you get better results. Do you have any tips or tricks for being more present at work?